As environmentally friendly trends around the world starts to take shape, one of the first industries to evolve is the automotive industry. Hybrid cars are now all the rage for fuel economy. And as the Toyota Prius and Honda Insight have proven, more efficient hybrid automobiles can be well accepted and do have a niche. As the pressure increases for these innovations to be found in all cars, the full-size luxury market seems to be the first place manufacturers are concentrating their efforts. This presented an opportunity for a revolutionary car to be developed. 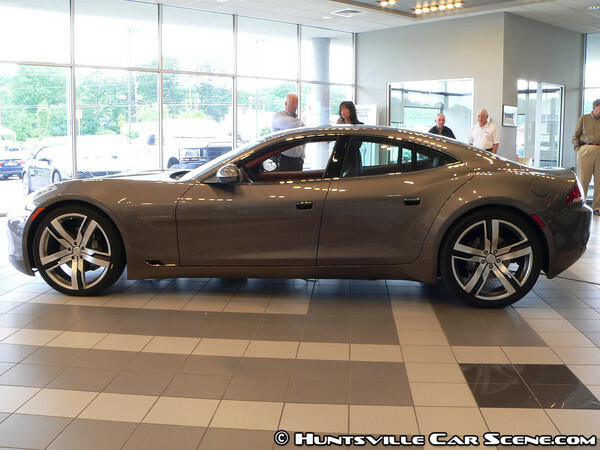 A car that I believe to be a glimpse of the automotive future--the Fisker Karma. 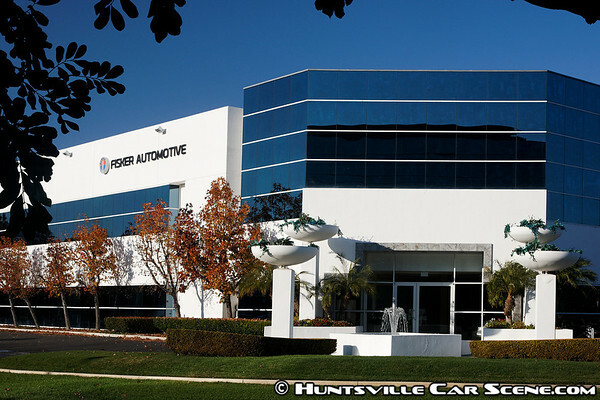 Fisker Automotive is a new American automobile manufacturer headquartered in California. Their mission statement is unlike any other in the automotive industry today--"a vision to lead the automotive industry into the next-generation of automobiles with high-end design expertise and eco-friendly powertrain technology." This is a bold statement, but I believe the Karma brings this vision to life. 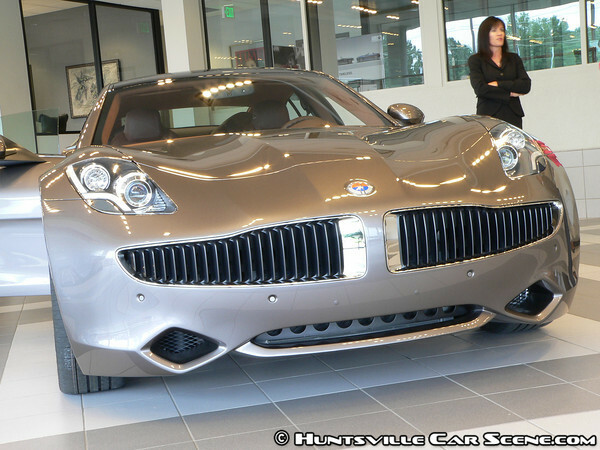 The Fisker Karma is a car unlike any other currently available. It's a hybrid that also is a fully electric car. 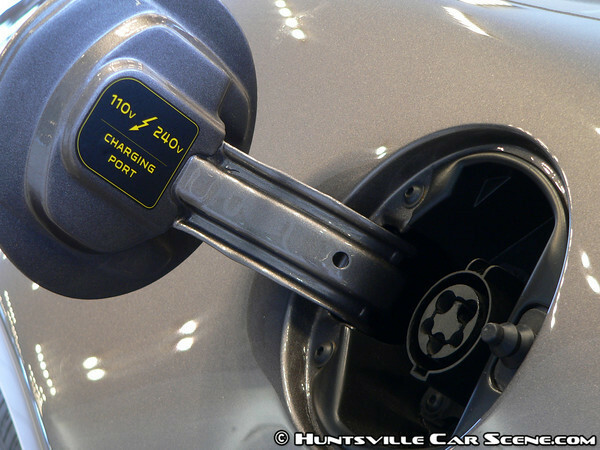 It's also able to be charged via a standard 110/220 outlet, very similarly to the Tesla. At one point, there was a legal action from Tesla against Fisker, but that has since been settled. Unlike the purely electric Tesla, the Karma also has a GM Ecotec LNF 2.0 liter turbocharged engine. This engine never directly drives the car, as it isn't connected to the drivetrain. Instead, it is used to extend the range of the Karma to an impressive 300 miles. And unlike purely electric cars, the Karma still has the convenience of fueling up and continuing the journey like a traditional gasoline-powered vehicle. Since the vehicle on display was a pre-production car, no one was allowed to see the engine compartment. But I was assured that an engine is there, as some others did get a sneak peak at it. This is the same engine found in the current Cherovlet Cobalt SS, so the only thing that would've been unique to see was how the engine was coupled up to the generator. The best feature about the Karma is not its technology, but its usability. On short trips of 50 miles or less, the car is fully electric. And if that's all it's used for, it will never need a drop of gasoline. But why restrict such a great car to just short trips? When your trip exceeds 50 miles, the gasoline engine kicks in and extends the driving range to 300 miles. 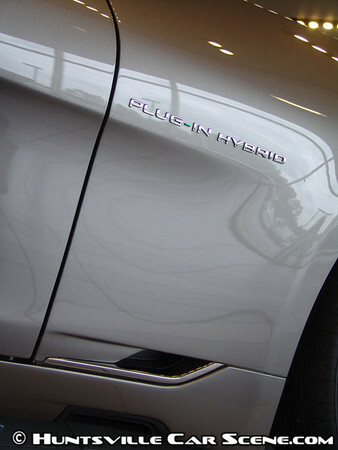 Fisker claims that an average of 100 miles per gallon can be achieved. That means a mere three gallons of fuel will send you 300 miles--something that is unheard of today, except by hobbyist hybrid owners that have done expensive modifications. But what is all this technology and usability without fun? Hybrid cars have a reputation for not being sporty. In fact, some even have a reputation for being on the ugly side. But not any more. The Karma is a sight to behold. The design is like nothing else you've ever seen, and yet is as appealing as a new car can possibly be. While similar in shape to other sporty looking sedans from Porsche, Aston Martin, Jaguar, and others, the Karma's styling doesn't need to grow on you, doesn't need some time to get used to--it just excites you. Maybe it's the 'Hot Wheels'-ish look from the large wheels, or the smooth body lines that flow from the front to the back. Whatever it is, it definitely appealed to everyone who saw the car. I almost unanimously heard that the car was "beautiful" and "awesome." I wholeheartedly agree. And the exterior design isn't the only part of the design that is appealing. I found myself just as impressed by the interior. Even though the materials in the interior are basically of a "recycled" nature, there's nothing recycled about it. 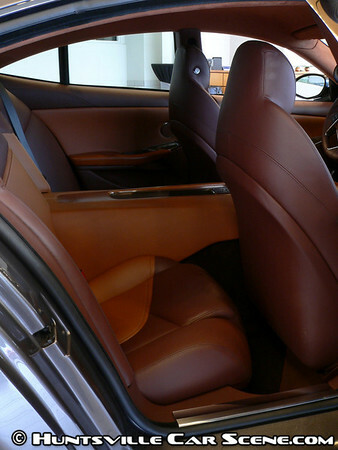 The two-tone leather seating felt supple and rich as did the leather accents found around the cabin. 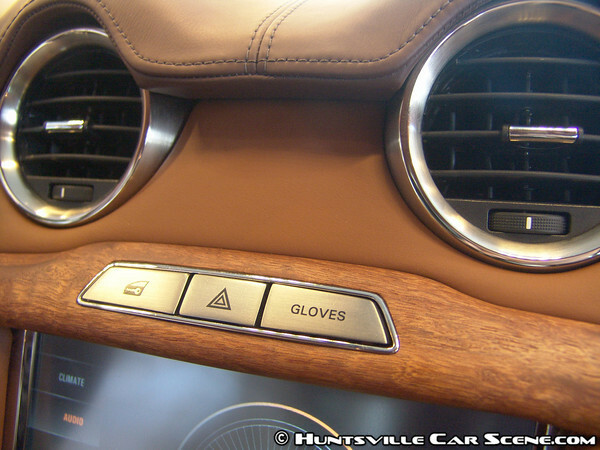 The suede headliner was a nice touch, although not as plush as the one found in the 2011 Jaguar XJ I saw last year. The wood accents with their matte finish blend nicely into the interior, creating a homogeneous interior from multiple materials. Brushed aluminum controls reminded me of the purposeful controls I've seen on airplanes, and even have an elegant, retro-futuristic feel to them. 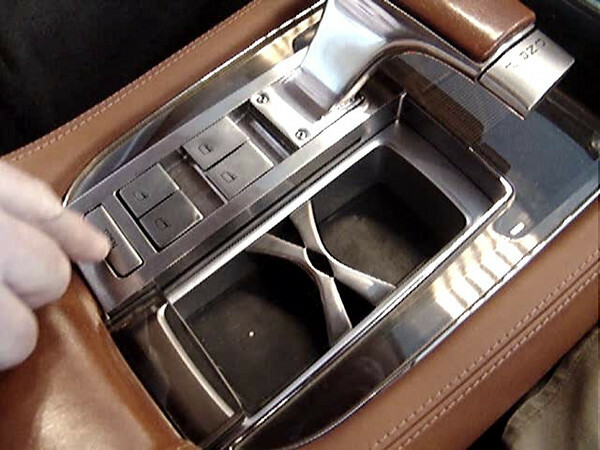 Because the batteries are actually stored through the center of the car, there isn't a storage unit below the armrest in the front. Instead, you'll find a power sliding glass cover above the cupholders. This had a very Star Trekky feel to it. I'm not sure how much purpose the cover will serve, but it sure did make a nice toy and conversation piece. The touch-screen control center was very nice. Because of the particular tone of the audio feedback from the touchscreen, it feels like there is tactile feedback when there isn't. The front seats were spacious enough for me, but were a bit cramped for those over six feet tall. 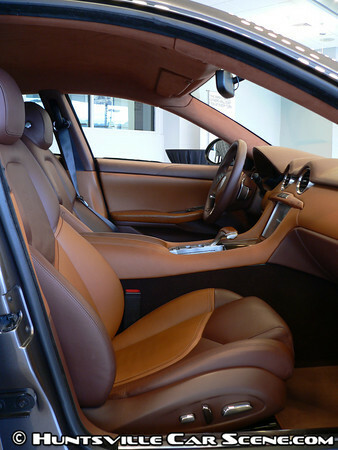 The side bolstering and head rests felt good, allowing you be be comfortably held in corners without becoming overly sporty. The space in the back feels a bit more like the back seats of a convertible--enough to get by, but nothing to really enjoy. The rear seats were a bit cramped for me, mainly because of the center console that takes up the equivalent of the third seat. But like the front, they are still bolstered nicely and hold you comfortably in place. When a taller person was in the front seats, your knees were at the back of the seat in front of you. The side view is dismal thanks to the high window line and the rear view is also similarly non-existent. The lack of a sunroof doesn't allow any light into the rear from above, so the only real light comes in from the front. Many described the space as "claustrophobic". The rear seats also were difficult to enter and exit. Unlike the similar looking sedans from Porsche and others, the Karma requires a twist in the hips mid-stride when getting in and out, and careful attention to not hit your head on the sweepingly low roof line. The door also required some attention when opening as the edge would almost hit you in the stomach if you kept your hand on the door lever. But these are minor discomforts that kids riding in the back would quickly overlook. 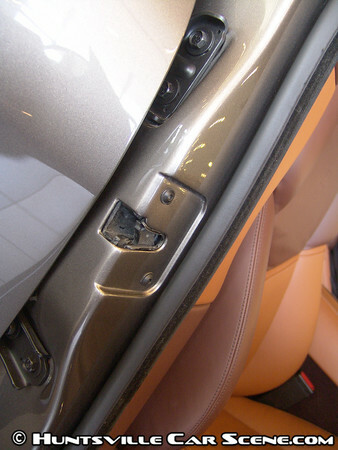 The doors are electronically actuated, similar to the Chevrolet c6 Corvette, and use a similar reverse striker/pin arrangement. The door actuation feels very similar to the General Motors implementation, and makes me wonder if it's the same design and components. When this handle-less design was introduced in the Corvette, owners feared what would happen without electrical power. In the Karma, because the power systems are much more critical, the same fear carries much more consequences than just the doors not opening. And because power is so critical in the Karma, I'm sure there's quite a bit of over-engineering on the power distribution that's not normally found in today's cars. 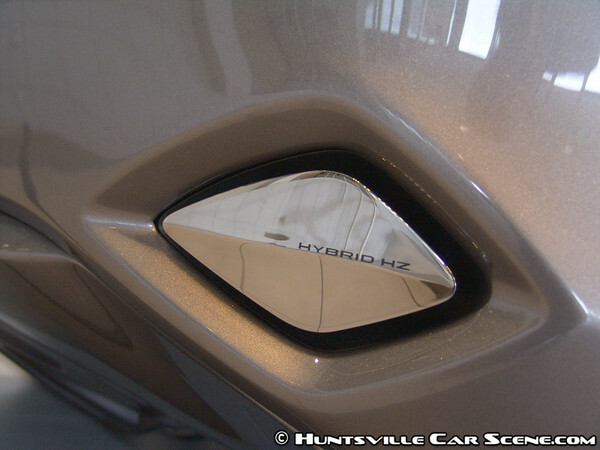 The exterior lighting systems feature LEDs for both tail lights and parts of the headlights. 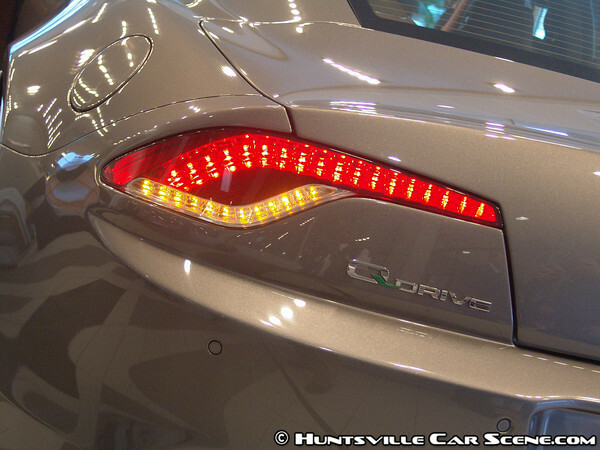 The tail lights are fully LED, with amber LEDs filling the clear section of the tail light when illuminated. 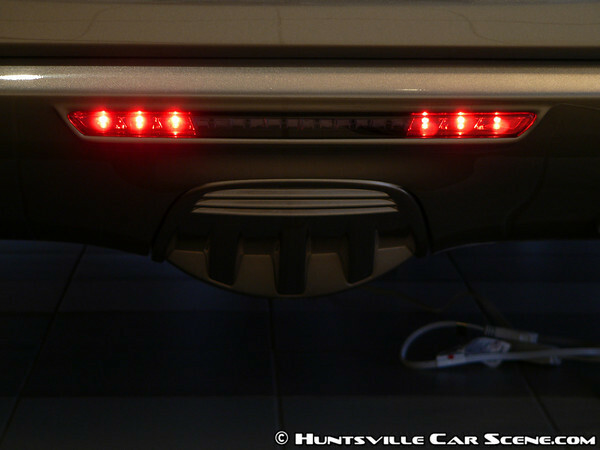 Red LEDs are used for the tail lights, trunk mounted third brake light, and running lights situated just below the license plate. It looks like a series of white LEDs are between the two running lights to serve as a reverse light, but it was never illuminated since the car was never in reverse. 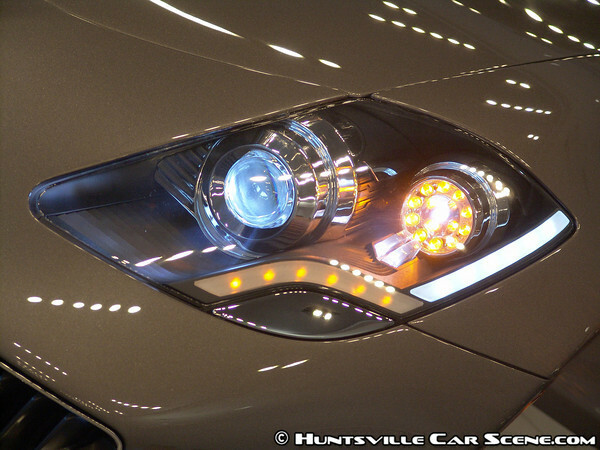 LEDs abound in the headlights assemblies, used for running lights, signals, as well as day time running lights. High efficiency Bi-Xenon lamps are used for the main headlights. One of the things I liked most about the headlight assemblies was the turn signal design. It's a copy of the front signal found on the 2011 Jaguar XJ, but still fits well into the design on the Karma. The trunk has ample space, and were holding two complete golf bags in the pre-production model. The surprising large 22" wheels flow well with the car. The classic 5-spoke design and matte finish enhances the Karma's sporty and exotic image. While the brakes look small under the wheels, with Brembo 6-piston calipers up front and matching 4-piston in the rear, they're seem quite adequate considering regenerative braking is also used to slow down the Karma. The tires were Goodyear Eagle F1 Supercar rated at 220/AA/A. 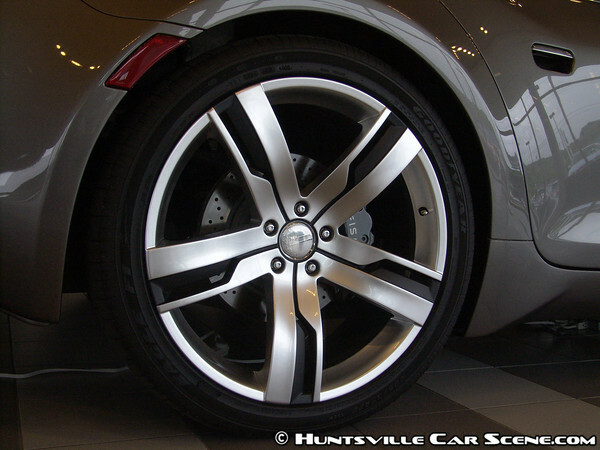 This differed from the original specifications which called for Michelin Pilot Sport 2s. And at 285/35/22 and 255/35/22, they are larger than the originally published specs of 265/35/22 and 245/35/22. Seems like they may have changed tire manufacturers as well as increased the amount of rubber. I'm sure this has translated to better handling, although I wonder what the cost of these tires may be. 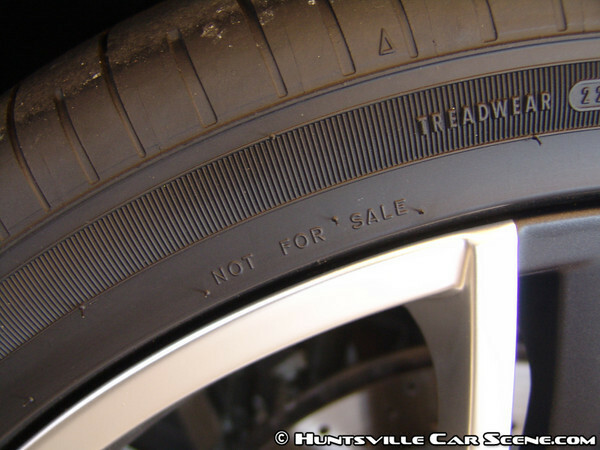 It was interesting to see the "not for sale" designation on the rear tires, also indicating their pre-production nature. The front styling of the car reminded me of Maserati. Looking closely at the front bumper cover and hood, I saw body lines that echoed Maserati design blended into the smooth skin of the Karma. It's almost like there's heritage in the car from some of the best designs around the world. No doubt this is attributed to the Henrich Fisker and his team, who have also worked on some of best designs the world has ever seen. With a car that looks as sporty as the Karma, you'd be disappointed if it drove by you and didn't make a sound. But that's exactly what it does. So in the place where rear exhaust diffusers might be, you'll find some small speakers which emit a tone. An idea that started to get thrown around really quickly at the showing was the possibility to customize the tone. Want to sound like a 67 Vette with a cam? There might be a tone for that. Or how about a Ferrari F430? There might be a tone for that. Or how about a F250 dually? Imagine the ring tone phenomenon with car exhaust tones. I think it would catch on like wildfire. On this pre-production model, the speakers weren't connected, but I was told that it emitted a sound similar to a golf cart when it was being put on the showroom floor. But if the Karma doesn't have any exhaust pipes, but has a gasoline engine, where does the exhaust go? There's actually a side exhaust on the passenger side right under the fender vent behind the wheel. You wouldn't even notice it unless you were looking for it. The performance of the Karma is another one of its accolades. While the 100 miles per gallon is sure to get everyone's attention, what is equally impressive is the sub 6-second 0-60mph and a continuous top speed of 125mph. This is only capable in the "sport" mode which uses both batteries and the engine, but the all-battery "stealth" mode has similar capabilities with a 7-second 0-60mph and a continuous top speed of 95mph. And this is all without changing gears as the two electric drive motors do not require a transmission to reach these speeds. A rear differential is present, and seems to be pretty beefy judging by the casing. And it needs to be when the two motors combined produce 403hp and a whopping 959 ft/lb of torque. A torque figure like that puts this car's available power above what most would find in this class. The pre-production model on display was hand built out of carbon fibre. It's one of about four vehicles in existence, and in the opinion of the man that put them together, the color combination on this one is the best. The production vehicle will be built out of traditional materials, and will be made in Finland at the same plant that made my Porsche Boxster. And if the quality of the pre-production model and my Boxster are any indication of the quality of the final production model, it will be quite nice. Overall, the Karma is a fantastic new car, especially for a first-run automobile produced by a new manufacturer. As the production cars hit the roads, I believe the Karma design will influence other manufacturers' products. 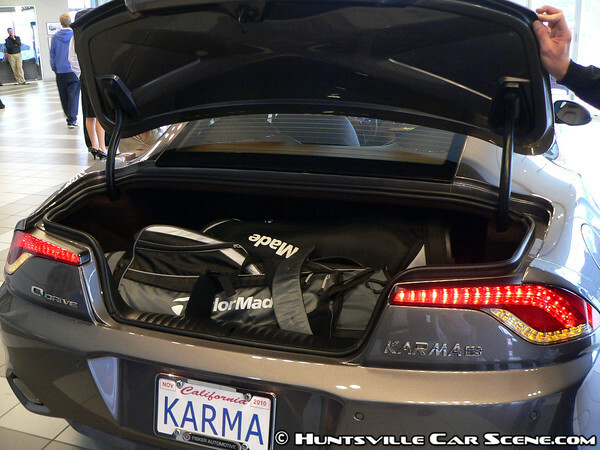 Mr. and Mrs. Jones of Century Automotive were are quite proud of the Karma. I think they understand it's potential, and the demand for such cars. They already have several deposits for one, so by next year we should see several driving around in the area. At an MSRP of $87,900, the Karma isn't cheap nor expensive for what it is. And a $5000 deposit secures you one. At the viewing event, the local press was well represented--Huntsville Times, Event Magazine, WHNT-19, and WAFF-48 were just some of the media present. They took a few shots of the car and did interviews, while I grabbed a few pictures of them working. Fisker Automotive provided several pictures of the car for this article, as well as some of their future convertible--the Karma Sunset. Be sure to check out the complete gallery, where you'll find these and the almost one hundred pictures of the car that I took. I want to thank Century for allowing me to attend this event, as well as my good friend Richard (ITSFAST) for calling me about the event. Glad you made it out there. It's a very interesting looking ride. Thanks to you! If it wasn't for your call, I would've just been working on photos from the weekend, oblivious to things happening on a Monday. It's an interesting car for sure. I really think this car also has a place in the racing world. I mean, if it can do 125mph for 300mi, I wonder what it can do for a 1/4mi. And if it can be tuned for that, I wonder what can be done for a lap or two on a mile circuit (or a wide open parking lot *ahem*). Instant acceleration, gobs of torque, no transmission or shifting--sounds like it could change things for sure. My boss got to make it down but I was trying to get everything in line for an event we had tonight. Hated to miss it but it looks like a sweet ride. It's pretty nice. The torque figure is what has me really intrigued. That's a lot of torque for under $90k. The Karma’s wide, low stance is a perfect recipe for flat handling, and it delivered that in spades. When we got back from the track, we noticed that the Fisker had occasionally picked up an inside rear wheel during cornering shots -- shots that looked otherwise completely anti-climactic due to the absence of body roll. Brake dive, too, is notably absent -- thank the Karma’s low center of gravity (at 18.9 inches high, according to Fisker, it’s about the same as a Ford GT) and the weight distribution which, at 53% front, 47% rear, is what Ferrari considers ideal. Cornering grip is, for lack of another word, tremendous. The Brembo brakes have tremendous initial bite, and didn’t show the faintest signs of stress after a few hard laps. Too bad Century didn't get in touch with me. I would've loved to supplement this first look with a full review.